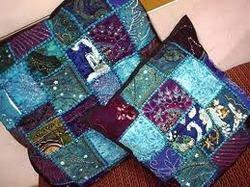 Beaded Patch Cushions from India are completely handmade and absolutely stunning. This Handmade floor Pillow is created using vintage tribal fabrics of local villagers in Rajasthan, India. It can be used as decorative throw cushion or floor cushion or sofa pillow. We are leading Manufacturer and Exporters of all kinds of Beaded Cushion. We offer wide range of Beaded Cushion. We normally provide seasonal Beaded Cushion like Christmas, Halloween , Valentine, Easter etc. In order to meet varying demand and diverse requirements of the clients, we are indulged in providing a wide collection of Beaded Cushions. These elegantly crafted cushions enhance the beauty of the place and give utmost comfort to the people. 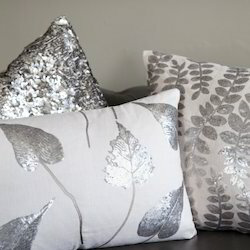 The beads we use in decorating these cushions give the distinct and attractive look. Hand beagule beaded embellishment & french knots on linen base. We are leading supplier of Bead Cushion.